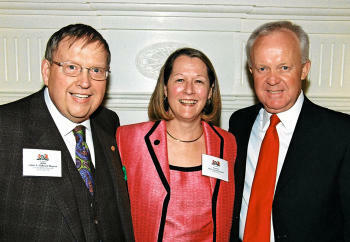 John T. Milburn Rogers (left), president of the Southeastern Chapter of the American Board of Trial Advocates, congratulates Justice Cornelia Clark (center) and Judge J. Mark Rogers (right). The Tennessee Chapter of the American Board of Trial Advocates named Circuit Court Judge J. Mark Rogers of the 16th Judicial District (Cannon and Rutherford Counties) as the 2009 Trial Judge of the Year at its annual banquet and awards ceremony on April 10, 2010 at the Hermitage Hotel in Nashville. The organization also honored Tennessee Supreme Court Justice Cornelia Clark as the 2009 appellate judge of the year. The American Board of Trial Advocates is a national organization dedicated to elevating the standards of legal profession and furthering the education of trial attorneys. Born in Woodbury, Judge Rogers is the son of the late C. D. and Lois Rogers, and a graduate of Middle Tennessee State University and the University of Tennessee College of Law. Rogers maintained an active trial practice from 1977 until 2004 when he was appointed Circuit Judge by Governor Phil Bredesen and thereafter, elected in 2006 by the voters of Cannon and Rutherford Counties. Judge Rogers is married to Dr. Jean Anne Rogers, an Optometrist, and they are the parents of three daughters, Jan Margaret, Anne Katherine and Addison.